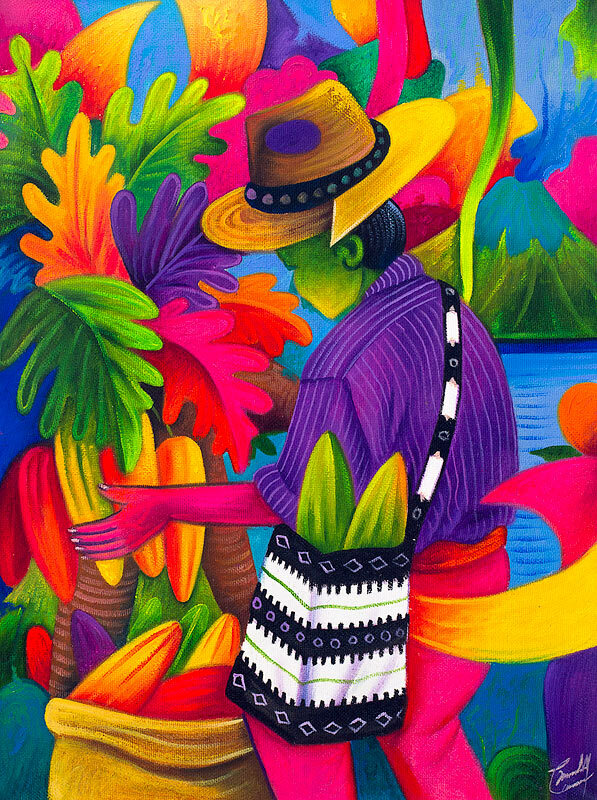 This year I made a very difficult decision – to discontinue the Arte Maya Calendar after eleven years. I considered passing it on, but every scenario also included significant involvement on my part. The calendars took up much of my time during the year, and took time away from focusing on the Maya artists. I will now refocus this energy on exhibitions of the paintings and publishing material on the Maya Artists. My first effort, a free e-book, I offer (below) in this issue of the newsletter. 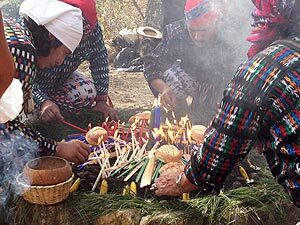 For those of you looking for a 2013 Maya/Guatemala calendar, there are links and information at the bottom of this newsletter. 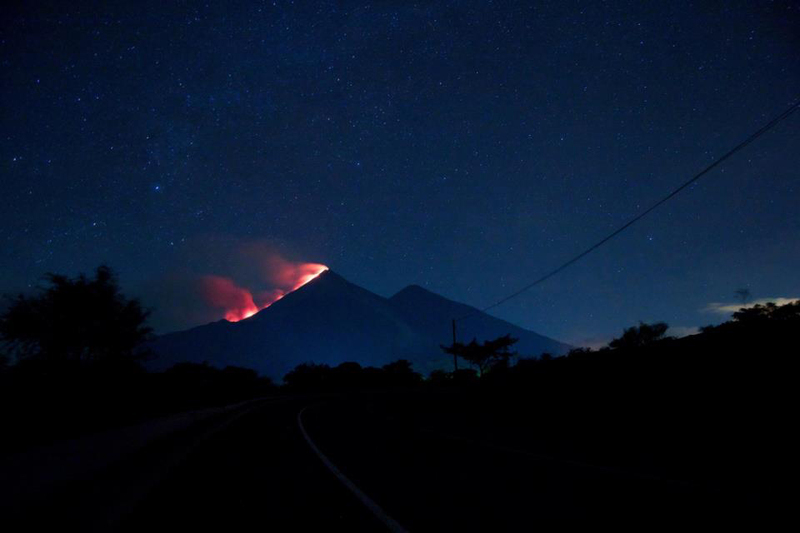 The Volcán de Fuego, one of three active volcanoes in Guatemala, erupted the 12th of September, 2012. 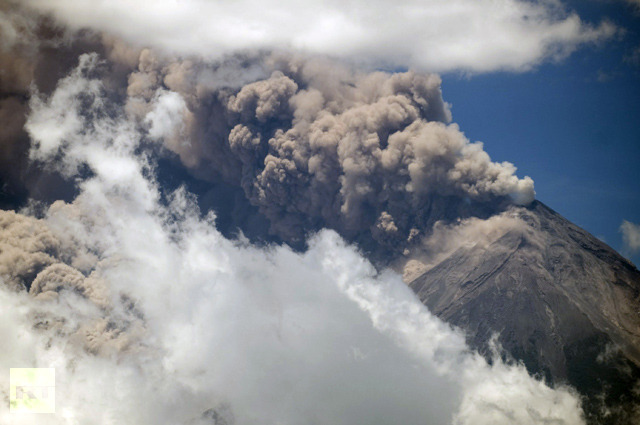 This is the biggest eruption since the 1940s. Authorities evacuated around ten thousand people. The eruption has already subsided, and volcanologists had predicted a short duration. 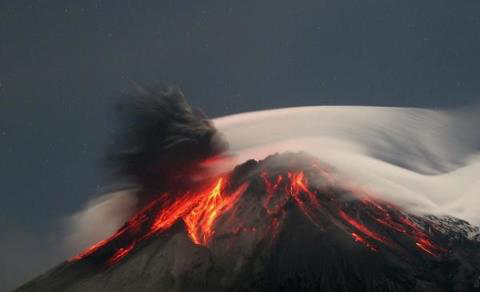 The photos at the top of the page and above are the most dramatic that I could find of the current eruption. Click on them for larger images. 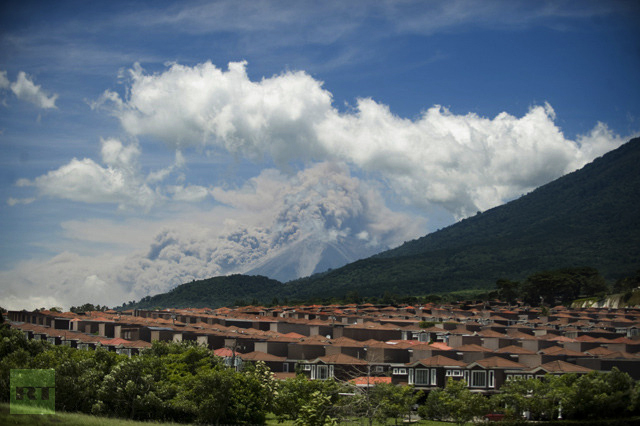 Follow this link to a Prensa Libre article and video on the eruption. 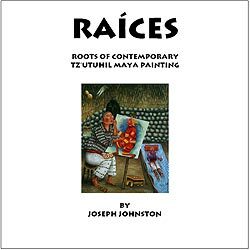 This book traces the influences both Maya and Spanish, that influenced the Tz'utuhil Maya culture from which the contemporary Tz'utuhil painting movement blossomed. The book has 19 original illustrations, and is 26 pages long. Available in two digital formats. I have tested the two formats on my computer, an iPad, and iPhone. There may be other devices on which it does not display correctly. Please let me know if you have a problem on your device so that I can correct it or make another version for this and future publications. Please feel free to share this book. I highly recommend this article from ProPublica. It is one of the most compelling personal histories I have come across. by Sebastian Rotella, ProPublica, and Ana Arana, Fundación MEPI May 25, 2012, 6:59 a.m. The call from Guatemala put Oscar on edge. Prosecutors came looking for you, relatives in his rural hometown told him. Big shots from Guatemala City. They want to talk to you. Oscar Alfredo Ramírez Castañeda had plenty to lose. Although he was living in the United States illegally, the 31-year-old had built a solid life. 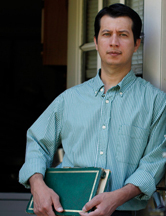 He worked two full-time jobs to support his three children and their mother, Nidia. They had settled in a small but cheerful townhouse in Framingham, Mass., a blue-collar suburb of Boston. Taa' P'it Kortees, an Intercultural Learning Center for Tz’utuhil Mayan children, is a unique, Mayan-founded non-profit in San Pedro la Laguna in the Highlands of Guatemala. Taa’ Pi’t serves 120 students between 6 and 11 years old with programs in: computer technology and ecological education founded in the Mayan cosmovision and built on the strengths of the Maya culture. 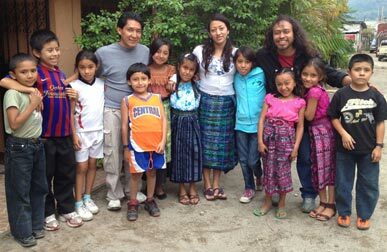 These programs change the capabilities and attitudes of the children, influencing their families and the community, and help strengthen the Maya Tz'utuhil cultural heritage. “When choosing between two paths, ask yourself which one has heart. Who chooses the path of the heart is never wrong.” Popol Vuh, the sacred Quiche Mayan book of creation. Casa Rosario Spanish school has added four short videos to their website that provide a glimpse of life in San Pedro la Laguna. 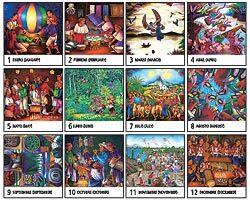 The third one is a favorite because it shows what it is like to live with a Maya family. Huffington Post had an article about a United States Marine operation in Guatemala to provide military assistance to the Guatemalan government with the drug war. In light of the history of United States military involvement in Guatemala, and the atrocities carried out by the Guatemalan military during the 1980s, many people have expressed concern about this operation. For ten years NISGUA supported the Arte Maya Calendar by paying for and selling half of the print run. Without NISGUA's help the calendar would only have lasted one year. This year they have published a 2013 calendar of photographs of Maya Guatemala. The sale of their calendar funds much of their operating expense for the year. The work of NISGUA promotes human rights in Guatemala. Shihoho Nikawa has produced a retrospective 2013 Arte Maya Calendar. Shihoho was the NISGUA contact who worked with me on the Arte Maya calendar for many years. 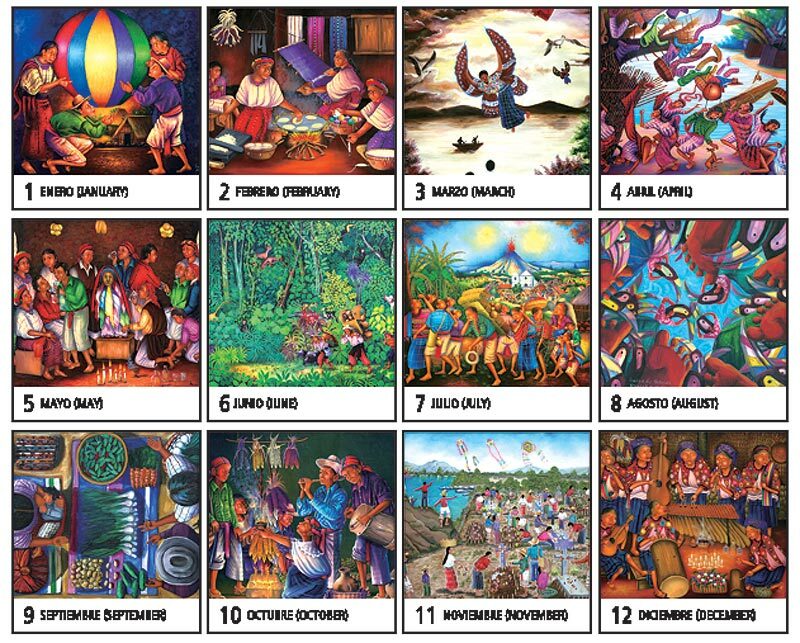 Shihoho’s 2013 calendar, in Japanese and English, consists of paintings that were published in earlier editions of the Arte Maya Calendar. The calendar includes the Maya glyphs for every day. Although the calendar is primarily intended for Japanese audiences, readers here can purchase copies directly from Shihoho. Because of the exchange rate between the dollar and the yen, it will cost $25 plus $8 shipping. If interested contact Shihoho at recom@jca.apc.org.